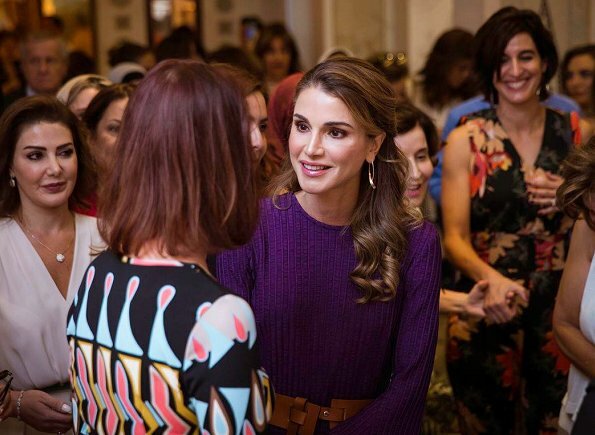 Queen Rania of Jordan launched the 22nd edition of the Jordan River Foundation’s (JRF) annual handicrafts exhibition, titled ‘Vintage Dreams’. Jordan River Foundation is a Jordanian non-profit, non-governmental organization established in 1995. Since its establishment, JRF has launched numerous socio-economic projects for women, providing employment opportunities to enhance their livelihoods. I absolutely love this outfit, obviously not for every type, but definitely por Rania. The belt is a very daring option, not to my taste, but risky and different. Fantastic purse... she looks thinner than usual, maybe the pictures? ?